Home › New Content › New Title from Falls City! New Title from Falls City! Thanks to the generosity of the Dallas Public Library, new content is now available! 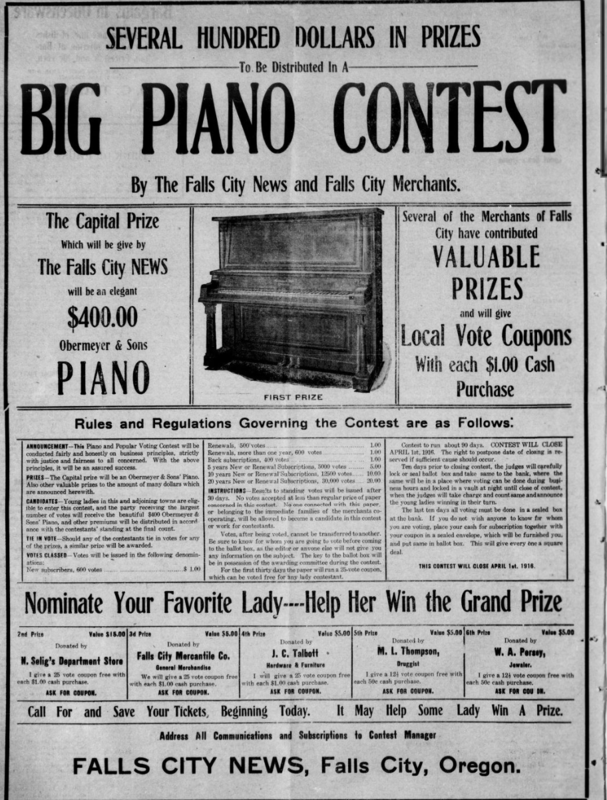 The Falls City News has been digitized and is currently available on the Historic Oregon Newspapers website. To learn more about Falls City and see more from Falls City News, please feel free to browse other issues from this title found on our website. Thanks to optical character recognition, this title along with all other titles located on our website, can easily be browsed or searched using keywords. In addition to this, all of our content can be downloaded as a PDF or JPEG and saved for future reference or research. Take advantage of these free public services offered by the Oregon Digital Newspaper Program! “Census of Population and Housing” United State Census Bureau. The United States Government, https://www.census.gov/prod/www/decennial.html#y1920. Accessed 20 Aug. 2018. ‹ Many New Titles from Deschutes County!